One of my favourite looks but one I don't wear nearly enough is red lips. 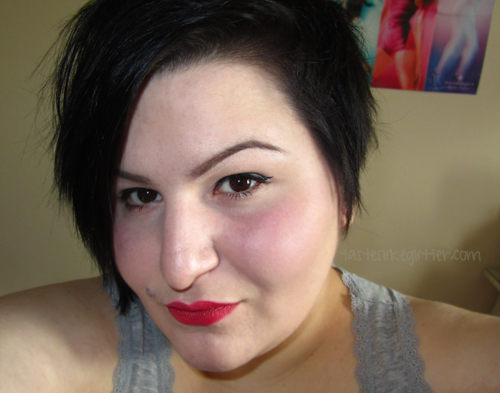 My first red lipstick was M.A.C's Russian Red since everyone seemed to swear by it as an amazing blue based red. It's a matte and no matter how I apply, I can't get on with it. So whilst I was pursuing my Benefit counter back in the Summer and my eyes came across a beautiful, glossy red with a cool undertone, I knew had to have it. 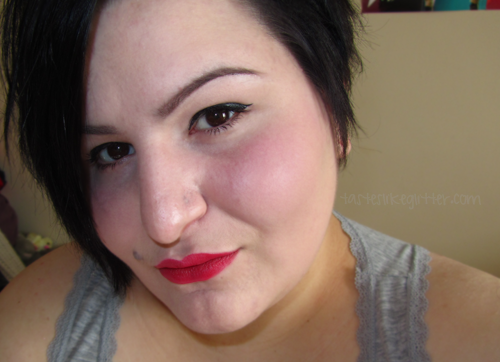 It's since become my favourite between Benefit and Revlon's True Red (1/2) / Fire & Ice. After I did this look, I couldn't stop looking in the mirror. It'd been a week or so since I'd worn makeup since my skin had gone all dry and sore. I'm sure I'm not the only one to say this but when I take FOTD pictures I take 348753 million photos. For this look I took 4. Oh yes, you read that right. I am using the first picture and the third. The first picture?! Crazy times right. I was extremely pleased with how I looked yesterday. Illamasqua Skin Base - 2. Urban Decay Eyeshadow - Virgin (all over lid). Benefit High Beam (brow highlight). Benefit Full Finish Liptick - Flirt Alert. I didn't go with the 'full-finish' of Flirt Alert as I knew I'd be eating and drinking so I didn't want it to have to much slip. I lined with a lip brush and then just filled it in also using the brush. It gave a blotted semi matte look. You can see it in all it's glossiness here. I definitely need to wear this combination more often, I love it. I love red lips, there's just something that makes me feel beautiful and womanly. What's your favourite way to wear a red lip? I'm also (hopefully) picking up my new camera on Wednesday, I cannot tell you how excited I am and I will be flooding your dash a lot more.